Bruce Hetherington sat holding the hand of his wife, Carol, as government officials finally made the announcement they’ve been waiting for: Nova Scotia’s Highway 103 will be twinned, beginning next spring. “We're so pleased with what we’re hearing, my wife cried,” he said. The death of their son in a head-on crash on that stretch of road nine years ago has made Bruce a tireless advocate for highway safety. “If Jamie had to die, then I know he would have liked to have died for a cause,” he said. Jamie Hetherington was killed instantly in the collision. His sister-in-law was injured, and the two occupants of the other vehicle were also killed. It’s a busy and dangerous stretch of roadway. 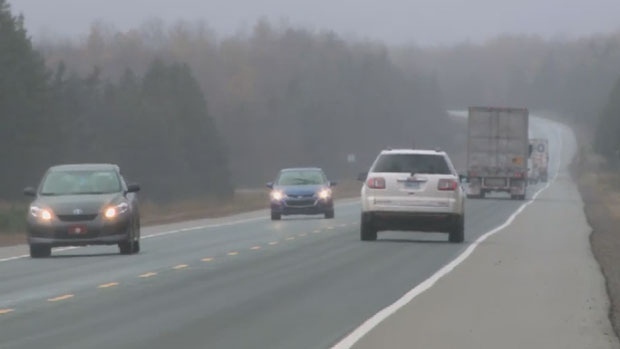 Provincial data shows that an average of 10,500 vehicles travel Highway 103 between Upper Tantallon and Hubbards each day. It’s the main arterial connection from Halifax to Nova Scotia’s south shore. Collision data from 2010 to 2014 show there were an average of 68.8 crashes per year on Highway 103 between Bridgewater and Tantallon. Highway 103 had the highest average number of collisions out of eight sections of 100-series highways that were studied during a twinning feasibility study released last year. That study and the subsequent public consultations led the province to isolate four projects it will undertake over the next seven years. In addition to the 22-kilometre stretch of Highway 103, twinning will take place on 9.5 km of Highway 101 between Falmouth and Three Mile Plains, and 38 km of Highway 104 between Antigonish and Sutherlands River. The four-lane Burnside Connector will also be built between Dartmouth and Bedford. The province is planning to spend $390 million on the four projects. Tuesday, the federal government announced it will invest $65.6 million for the $140-million project on Highway 103, and more funding may be coming for the other projects. The work on Highway 103 will begin in April of 2018. Twinning between Upper Tantallon and Ingramport is expected to be complete by 2020, while the stretch from Ingramport to Hubbards will be complete in 2023. “We want to be expedient as we move through this process, and so this one was the one we could tackle first,” said NS Transportation Minister Lloyd Hines. But as many people applaud the news of more twinning, the Ecology Action Centre in Halifax says this kind of investment fails to encourage sustainable transportation options, and contributes to urban sprawl. “Right now we only have public transit in a handful of our communities, and our communities operate community transportation programs, and so investing in those would really help us to close those larger gaps that we have in our province, and create a more sustainable transportation system overall,” said Eliza Jackson, the Ecology Action Centre’s sustainable transportation co-ordinator. Jackson says there are other options to make highways safer that would cost less, and allow for investments to be made in both areas. According to the province; however, twinning is the best way to reduce highway collisions. The province’s twinning feasibility study estimates the average number of crashes per year will drop to 21.6 from 68.8 after Highway 103 is twinned. For Bruce Hetherington, Tuesday’s announcement provides some satisfaction. “We’ll never get over the death. It’s not an answer to the death, but it’s a reason for the death – so other people can be saved,” he said. Nova Scotia's Highway 103 is seen in this file photo.